This is what showed up at our house this morning. I have been wanting one of these, I put the word out and (yipee) here one is. (love how that seems to work) Now we just have to figure out how to get it to work. I think we will need to fashion some kind of belt to get the two wheels spinning and some kind of something or other to attach the foot pedal to the big wheel. Help!! I might have to go to the spinners and weavers club and ask them for help. I also have two big bags of fleece from someone's pet sheep. We are going to have some fun with that. I better start collecting more of my plants for dyeing. I am supposed to be getting ready for our next trip but I think I might get a little distracted now. Looks like fun, Heather! 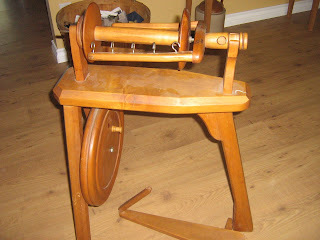 I guess you'll be spinning yarn for your projects before we know it. I must admit I've been eyeballing a loom that I've seen... I could really get into weaving. Oh, what joy to try new handicrafts.